Just for throwback’s sake is the first installment of our car club story here that helped shed light onto some of our land’s best car clubs and media organisations. A jointly owned initiative by car enthusiasts Bee and Chris in 2015, this newly set up club often review and talks about properly tuned cars of not just our region, but also Singapore and Thailand. Rice is basically an acronym for “Race Inspired Cosmetics Enhancements”, thus the term rice-y cars that we commonly see on the streets. The website is packed with well-taken photos of cars with an in depth feature of each, alongside some DIY and informational stuff like “How to start modding your car: The dummies guide”. Not only is it beginner friendly, but there’s plenty of eye candy and well-written stuff up on the website. They also have an event coming up so stay tuned here and here. If computer geeks and gamers have their special websites, then car nerds have Hayashi86.com to visit for all cool story headlines that are all about cars but with a personal touch. In general, the site covers events, launches, reviews, and so much more. A huge fan of and personal owner of the Toyota AE86, the site owner updates his readers on news of any updates on his own AE86. So expect some stories of Mr. Hachi, the brand’s ambassador on both the site and social media accounts. If you’re an absolute fan, there are t-shirts that you can get. The success of the site can be credited to the owner, who is said to be a cool dude. Check out the blog here. There’s also an Instagram and Facebook page to follow. 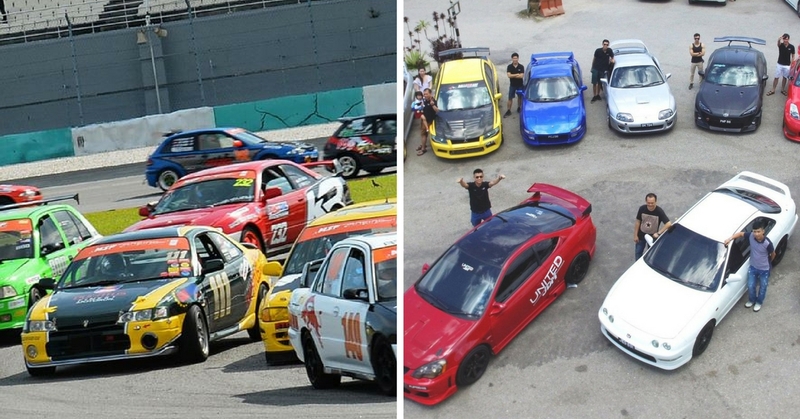 Short for Malaysia Speed Festival Racing Series, this is where you go to when you wanna make your racing dreams come true without the commitments that’ll cost thousands. There’s a track day calendar you can refer to and prices are around RM3xx but bear in mind there are very important rules and regulations to abide. Separated into two categories which is race and street, do make sure you head onto the website to know if your vehicle is eligible for registration. Not eligible but is a huge petrol head that just wants to attend the race and observe? Spectators fee have an all day access that go as low as RM20. Head onto their Facebook page and website for more details. This is for the peeps that live up north of Malaysia. This is also specifically made for Japanese car enthusiasts regardless of what type of vehicle (car or motorcycle) as long as they are Japanese-made with Japanese components. Short for United Japanese Domestic Market, the club is mainly used to organise meet ups among the car junkies, and is often where members go to seek advice and learn more from. Not only does this help friends at the northern region feel less left out from the cool car events that’s constantly going on in KL, it’s also an active community that constantly creates activities that are later on posted up online as fresh, quality content. Their Facebook page here is where it’s at.